Well, that was a quick month! Anyone else feel the same? 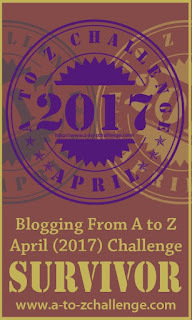 The A-Z Blogging Challenge of 2017 has officially ended, and once again I am simultaneously relieved and disappointed. While the pace of writing a blog post per day can be overwhelming, with a bit of forethought and pre-planning, it is doable. And crossing that finish line makes the effort all worthwhile! In this wrap-up post, I thought I’d share what I love most about this challenge, a few tips I’ve learned along the way, some new friends I met this month, and my excitement to participate again in 2018. I am a shy, reserved introvert. In other words, I avoid large crowds and enjoy time alone. I think this is one reason why I gravitate toward online challenges. I love NaNoWriMo. I enjoy #PitchWars. 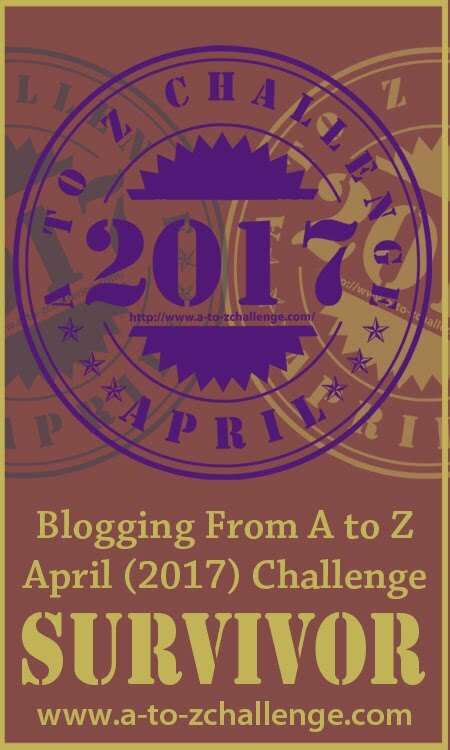 I anticipate the A-Z Challenge for 11 months out of the year. I think it is a way for this introvert to still be a part of the crowd. I am able to connect with like-minded bloggers that make me feel as though I am a part of a tight-knit community. We understand one other. We experience the same struggles and reap the benefits. We encourage one another to press on and then share in a mutual celebration. I also like the creative challenge of this annual event. The first challenge is to select a theme (if desired)… and writing 26 blog posts in 30 days takes discipline. But the real difficulty is to make sure those 26 posts relate to corresponding letters of the alphabet. Some are easier than others… and some are downright impossible (Z is for Zzzzz??) But I like being pushed to think outside the box. This was my second year to participate in this challenge, and while many can effectively “wing it” … I find a bit of preparation helps make for a less-stressful month. I decide on my monthly theme well in advance. I knew in September 2016, I would blog about Journaling. I knew what I wanted to discuss, and created a matrix for each of the 26 letters to help me brainstorm how to categorize that information. It takes a bit of creative thinking. For example, I knew I wanted to talk about “show vs tell” (using Detail in writing) … but I also knew I wanted to discuss journaling our Dreams and the importance of a routine. It made little sense to talk about routine at the end of the series (letter R), so it was important to address that topic near the beginning of the month. In the end, I decided to incorporate Detail in Nine Writing Tips (letter N) … and to creatively use Zzzzz to write about Dreams. The fourth day of the challenge I discussed the importance of Developing a Routine. (In case you missed it… here is a list of all 26 blog posts related to month of Journaling). As an added benefit, this year’s challenge was the push I needed to finish my first self-published book! With the rough draft complete, I plan to revise over the next two weeks and make it available as a Kindle ebook on May 23, 2017. The book includes about twice as much information as what I shared on the blog, and is organized in a practical, usable format: 28 Days to Develop a Journaling Practice. One of the biggest challenges of this event is finding the time to visit other participants’ blogs. I manage to respond to those who comments on my posts in a timely fashion, but I fear I do not make the rounds as much as I’d like. Rest assured, I will be spending the month of May visiting new blogging friends and catching up on their A-Z posts. I’ve already started thinking of possible themes for next year. I do enjoy travel and had a great time in 2016 writing about Paris A-Z. I’m giving thought to writing about Boston A-Z (coordinating with the trip I took last September) or New York City A-Z (lots of history here… and I will be returning for another visit this June). I also thought of writing about one of my hobbies, like Scrapbooking A-Z … or Christmas Traditions A-Z … or Christmas Recipes A-Z. Another possibility is to capitalize on the Middle-Grade historical fiction novel I hope to self-publish this fall and write about French Impressionism A-Z – which would showcase the artists as well as their works. Lots of possibilities and plenty of time to plot and scheme. I hope to see you next year… if not before. Do you plan to participate in 2018? You done good, Molly. I enjoyed reading your posts. This is my sixth year doing the Challenge, and it's the highlight of my blogging year. Plus I'm one of the co-hosts, which means I get to deal with it even when it's not April. Be sure to take the survey (https://www.surveymonkey.com/r/P66HGC6) and let us know your thoughts. Thanks so much for your encouragement, John!